Trade Beads and their history being such a major interest of mine led me to research Celilo Falls on the Columbia River, on the WA/OR border. Owen and I had an opportunity to once again visit the Maryhill Museum Site on the Columbia River located high up on the hill above the ancient area of the historic Celilo Falls, just east of the Dalles Dam. Historically there was a village located on the Columbia called Celilo Village adjacent to Celilo Falls where Indian people had continuously lived for at least 11,000 years. Martha McKeown, an Oregon State Historical Author, writes, “Longevity was not the area’s only significance. Prior to white contact, Celilo and the area now known as The Dalles linked a trade network that extended from the coast to the Great Plains, from what is now Alaska to the present state of California. Indians from all over the Northwest came to trade, socialize, and fish with local residents. From the south came obsidian, slaves, and shells; blankets and beads came from the north; pipestone, buffalo meat, and horses from the east; and wappato from west of the Cascades. Central to this trade network was the abundance of salmon. The arid climate of the mid-Columbia allowed Indians to air dry much of the salmon they caught for trade and later use.” The tribes who regularly traveled to the falls to fish and/or trade were the Yakima, Umatilla, Chinook, Siletz, Cayuse, Nez Perce, etc. all of them eager to have trade beads. Today when driving on Hwy 14, on the Lewis and Clark Trail above the Columbia River, a Washington Heritage site sign has a picture of beads traded at Celilo Falls. Blue Russians, Yellow Vaselines, Hudson’s Bay White Hearts, White Dutch tiles and Bohemian red faceted glass beads all are pictured on that sign. These trade beads were an important part of the trade going on in those days from this place, Celilo Falls. 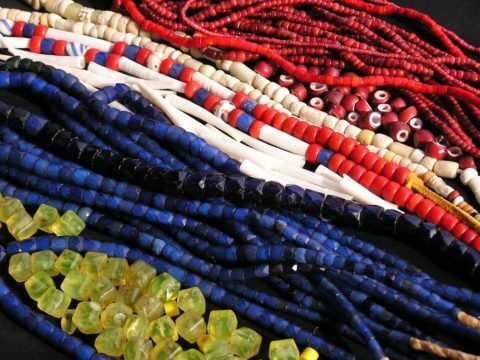 Thanks for the nice article about the trade beads and historic Celilo Falls. That area of the Columbia is so important to Native Culture more people should know about it. Just a historic aside, the blue trades beads were made in Liberec and Jablonec, Czech Republic. When I visited the Art Academy in Liberec they told me that the Jablonec Glass Factory was famous for making Indian Trade Beads from the 1700’s on, and still makes other things today of the same blue glass. Funny I knew about the old blue beads from the Pacific Northwest and Alaska and then was actually at the place where they were made years ago. Hi Chris, Wow! 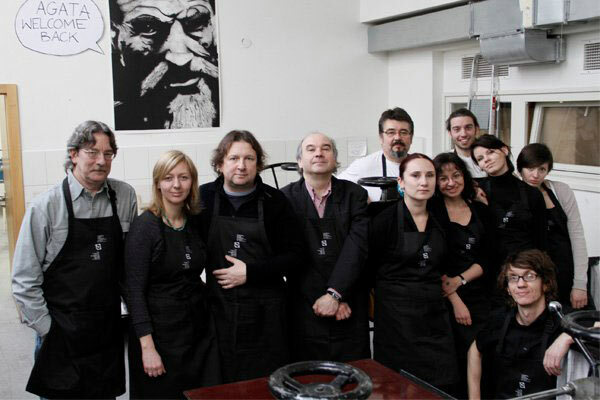 I would love to visit the Jablonec Glass Factory! I would love to visit that whole area. My ancestors came from that area of the world and I’m very curious about it. Jan Leopold Riedl founded leading beadmaking factories in neighboring towns. His glassmaking factories made the glass canes then farmed them out to be finished in small shops or homes through the area. They were famous for their ground facets and molding techniques. Even came to the point of outselling the Venetians by sending salesmen around the world with “samples”. The beautiful blue beads and other colors too were marketed and bought by many different folks for many different reasons. Some of my relatives from that part of the world pre-1800s were named Readel ! So I’m feeling that I come by my curiosity and passion for trade beads thru my genes! One day maybe I can swing a visit. “Grand Ronde.Cayuse, Umatilla, Walla Walla, Nez Perce, and Yakima Indians wanted to trade with the Pioneers In 1845. Pioneers said the Indians wanted to trade Fish, wheat, potatoes, Peas, squash & corn for anything. Pioneers reported they looked very prosperous and healthy. Women beautiful and covered in trade beads and woven basket hats.” This is info found on signs at the reststop in the Grande Ronde valley. Reported to have been excerpts from Pioneer journals, 1845. These were the same tribes trading at Celilo Falls with the Chinook, Klikitat, Umatilla and others from down the Columbia River. There were a bunch of tribes that came to Celilo Falls to fish, trade and bury their dead on Memalooose Island in the Columbia.